Today's blog comes from one of my favorite photographers in town, Shay & Olive. This fabulous duo has photographed some of my favorite arrangements, including the image on my own home page! So when Hilary's future sister-in-law Emily approached me, of course I was so thrilled! I created a floral arch, a hair piece, and some bouquets for this lovely couple, and I loved the pretty simplicity of their vision. EEEE this wedding! Ashlee and Jacob are an amazing couple, guys. I loved the experience of doing their flowers, not only because Ashlee and Jacob have an amazing sense of style, but also because they clearly make each other so gosh darned happy. There's not much else to say about this wedding except that it was just clearly such a happy day, and I am so glad to have been a part of it! Ah, what a sweet day. When Ashlee approached me to do her wedding, I was so flattered. She is one of the most stylish women I know, and she and Jacob are a fantastic couple. Here are some shots from her bridal portrait session with Tyler Tydell Photography. Is she not so gorgeous? Sigh. More on her wedding later! It's a truth rarely acknowledged to strangers, but a truth nonetheless: florists are dead in the water without talented photographers. My attempts to photograph my own flowers are generally abysmal. That's why when a florist finds a great photographer, we make friends. A good photographer can capture image of something so temporal and make it last. Not to mention, flowers can be hard to photograph. The layers and textures can be difficult to capture. Chelsea is not only talented, she's kind, reliable and generous. So much so she offered to photograph me as I worked! Take a look. And as a thank you, she generously offered to photograph me in action. Another secret I'll share with you: floral work is not pretty. There are lots of buckets of cold water, thorn-pricked fingers, messy green-smushed stem parts, and lots of debris around when you make an arrangement. So when Chelsea came to photograph me in action, she had her work cut out for her! She did a fantastic job, though. First off, I'm not above raiding my own yard for a bride. I love to work with Tia Gibson's art cheering me on. This is the face my dog makes at me when I work; mostly because I won't let him chew on leaves and stems! I live in one of the few old growth neighborhoods in Dallas, and it provides me so much inspiration. I'm so thankful Chelsea was able to capture that. Thank you, Chelsea, for a wonderful day and for being a mutual support of working ladies with hugely engaging businesses. High five to you. As someone who both owns her own business and has a full time marketing job, sometimes my work in one fades over into my work in the other. I'll put it this way: I've definitely been known to store flowers in my office closet! But my absolute favorite overlap is when I get to do flowers for my friends and coworkers. My boss, Mack, married his longtime love, Jen in Austin and honored me by asking me to do their flowers. Jen loved anemones and is a UT grad, and as Mack went to TCU, well, the color scheme clearly had to be bright, fun, and representative of their school pride! It was a fantastic day! Yeehaw! So it's been snowing a lot here in Dallas lately, but that hasn't stopped me from wanting to capture the colors of early spring! Same with Hilary over at Hilary Grace Photography. Coral pink anemones. Nothing better. Even though her sister's bridal shower had to be postponed, my photographer friend made her feel special with a small surprise shower, complete with naked cake and champagne! But she took a little time to get some photos with that gorgeous natural white backdrop first. I love flowers in unusual containers, like this copper gin mule mug. Who says winter has to be cold, with bold colors to warm you up? Loved making this fun floral crown. My inspiration was "chiaroscuro," meaning in floral terms that I wanted a contrast between really light and really dark colors. Mission accomplished! Didn't hurt that our model was just about the prettiest gal I've ever seen. 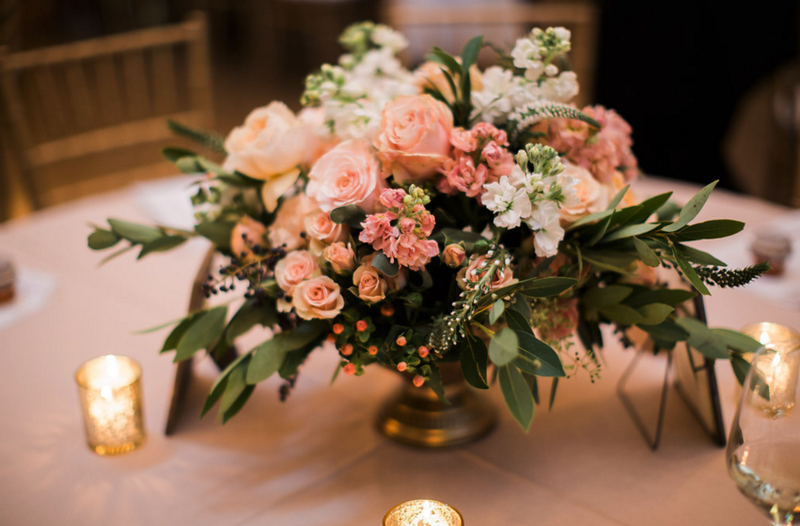 The centerpiece featured David Austen roses and dahlias. 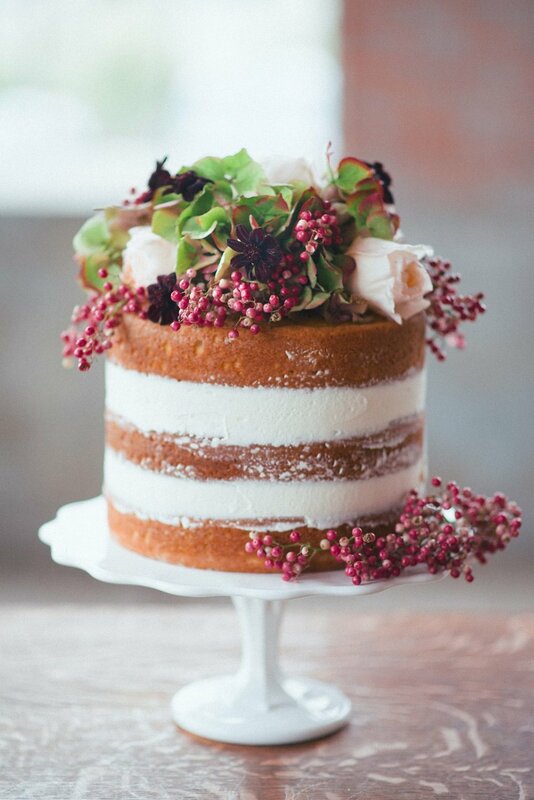 And Emily of Jar Cakery made the most beautiful cake that we topped with hydrangea, roses and pepperberry. This March, I had the infinite joy of doing the wedding flowers for the sweetest couple, Leah and Eric. This adorable couple had one request: "Make our flowers classic...with a twist." So, in true Bonney Blooms style, that's what we did! With Eric's job as a wine rep (best job in the world sounds like!) and Leah's time in Iowa and North Carolina, it was clear that spring flower wine boxes were a must... with privet berries to harken back to dripping grapes to complete the centerpieces. Pink peonies, shot by the lovely Hilary of Hilary Grace Photography. Purple sweet peas, fuschia peonies, and green verbena gave some bright color to the bridesmaids. And freesia boutonnieres save a clean, classic look to the guys. The reception space, The Venue at 400 N. Ervay, was throughly stunning. Congratulations to Leah and Eric! What a pleasure to work with.